We're sorry, this product has been discontinued. With the same functional design as it's little brother the Duet II was born out of necessity for an even brighter, whiter and more versatile light. 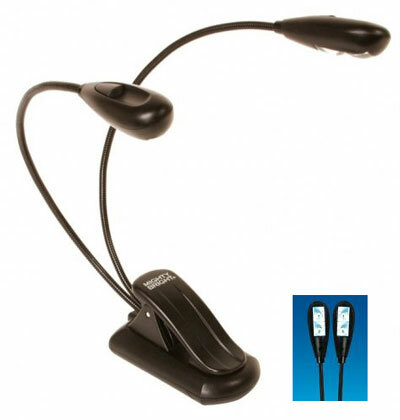 The ideal task light for large music stands, sound techs, backstage areas or recording studios. The Duet II accomplishes its mission – providing double the bright, white, LED light of the original Duet and offering more versatility with its AC adaptability. The Duet II contains (4) SUPER, BRIGHT LEDs (light emitting diodes), each providing three times the bright white light of a standard LED – providing 12 times the brightness – and they last virtually forever (over 100,000 hours). Two separate lighting heads each contain two LED bulbs, both with their own on-off switch, offering the option to use one or both lights on each head. All Super LEDs are manufactured with a lens to spread light evenly, eliminating hot spots, and distributing the light to cover a larger area. Outfitted on two heavy-duty gooseneck arms, the light beams can be quickly adjusted to shine in any which way, covering two pages of sheet music and more. The Duet II is energy efficient and wireless, affording extra-long battery life and powered by three tiny AAA batteries. In addition, if venue lighting technicians prefer control of all stage and pit lighting – including music lights – the Duet II also runs on AC power with included AC adapter, a huge improvement on the original Duet. With a strong, large-opening clip, the Duet II can be clipped onto numerous surfaces, including all music stands, or used as a freestanding wireless lamp. This versatile and invaluable light source is for everyone involved in music and music making – bands, orchestras, musicians, students, roadies, DJs, and professional sound and video technicians. What a great product! I have the single battery powered Mighty Bright and wanted to upgrade. Sure enough this model puts out quite a bit more light without giving you a tan on stage. Having the option to be portable with batteries if need be is nice too. Highly recommended! Wood and Clear Plastic Sheet Music Holder Clip 10 in.